The guest for today’s Answers From Leadership podcast is Keith Wilmot. Now, Keith is the President & CEO of Leadercast. What do you want listeners to know about you? What difficulties have you faced in your leadership? And what did you learn from those challenges? Leading Leadercast can be daunting. The event brings in 125,000 leaders. What is the Leadercast event? 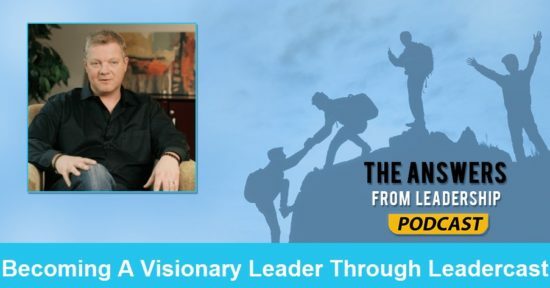 How is the vision of Leadercast different from other leadership conferences? What leaders will be at Leadercast Live 2016? How can someone experience Leadercast? The event is designed with the host site in mind. This is because a majority of the audience will be watching instead of attending in Atlanta. Don’t fret if you can’t make it to Atlanta. The simulcast is made for you! What’s one thing you wish you would have known about leadership 10 years ago? Leadership has always been a soft skill that people feel like it isn’t measurable. Yet it is measurable. What’s one book you’d recommend to help a leader grow?